Internet growing day by day. Now so many URL are used daily. Everybody has to remember so many URLs in his daily working life which he need to use somewhere. For this either he has to remember that URL or he has to copy paste it somewhere. If it is small URL than its easy to remember or share. But in case of long URL its became complicated to use that URL for sharing purpose. By keep such things in mind many companies started shortening the URL like GOOGLE also started the shortening URL service. As many people are visiting many URLs in his daily life so few company like Adf.ly start taking advantage of this and making money from this. Companies like Adf.ly also give chance to its user to earn money by shortening URLs and sharing them among their friends. In such case You have to click on Skip Ad button showing at the right top corner of page to access the actual URL. In meanwhile the Advertisement will be shown to you. You can also earn by doing such a easy task. The Adf.ly will pay you for every visit the visitor do after clicking your URL. Register to the site as a publisher. If you want to advertise your product or site than you can go for the advertiser registration also. But for earning money you must subscribe to the publisher. Now chose any URL which is seems to be interesting and short it using ur Adf.ly account. Now give that link to your friends so that the click them. As soon they click the URL you will get paid by theAdf.ly. You can check it by login to you account page. Put the shorted URLs to ur blogs or forums or social networks. Put that URL in facebook also.facebook has recently banned the Adf.ly but now there is a new Domain provided by Adf.ly which will also work in facebook.So you can now share it on facebook also. 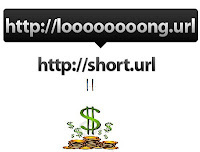 So What are you waiting for go to the below link and start earning from shortening URL's. nice share of this post. thanks for sharing.